I have a confession to make. I’m addicted, wait … obsessed would be a better term here, with the southern Indian specialty, banana leaf rice. Those fluffy white grains drenched with the reddish/orange-coloured elixir that promises a spicy, pungent yet most-revered kick, paired with unlimited supplies of pickles, curried vegetables, and crispy papadom crackers. Served on an over-sized cut of banana leaf which is believed to impart whiffs of fragrance to the overall ensemble, one is even required to adhere to the several customs/guidelines, ie : To fold the banana leaf towards oneself after the satisfactory meal (or fold it up away from you if the food’s darn horrendous), and to eat with your hands whenever possible, to fully savour the delicious combination of curries, meats, assortment of vegetables and rice. 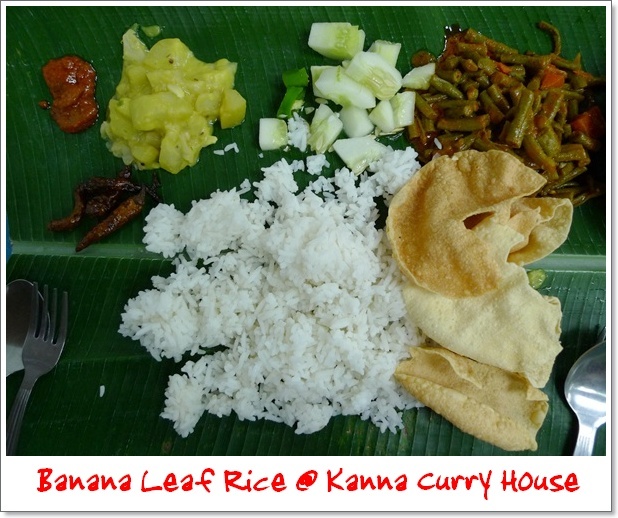 Kanna Curry House had to be one of the most talked-about banana leaf rice outlet in the Klang Valley. Initially we had problems locating this restaurant, nestled in the middle of a row of shops that are closed at night. Truth is, Kanna Curry House in Section 17, Petaling Jaya is situated behind Lisa De Inn that faces the Rothman roundabout. After repeated rounds and no GPS at hand, we finally managed to bump into the brightly-lit restaurant with yellow-coloured neon signboard that forms a huge T (Refer to the last picture for a closer look), proudly exclaiming the Kanna Curry House Restaurant brand. A portion of banana leaf rice at Kanna’s is priced at RM4.80, and comes with unlimited amount of rice, gravies, assorted vegetables and pickles, and crispy papadom crackers. Going vegetarian at Kanna is never a chore, really. The flavourful array of curry long beans and carrots, refreshing cuts of cooling cucumber, dhall with potatoes, and even salted, pickled dried chillies that were rather harsh on the palate, made up the most sumptuous meal of banana leaf rice. For the sides, one can choose to order the deep-fried seafoods and meats marinated with chilli powder such as squids, crabs, chicken and various fishes. 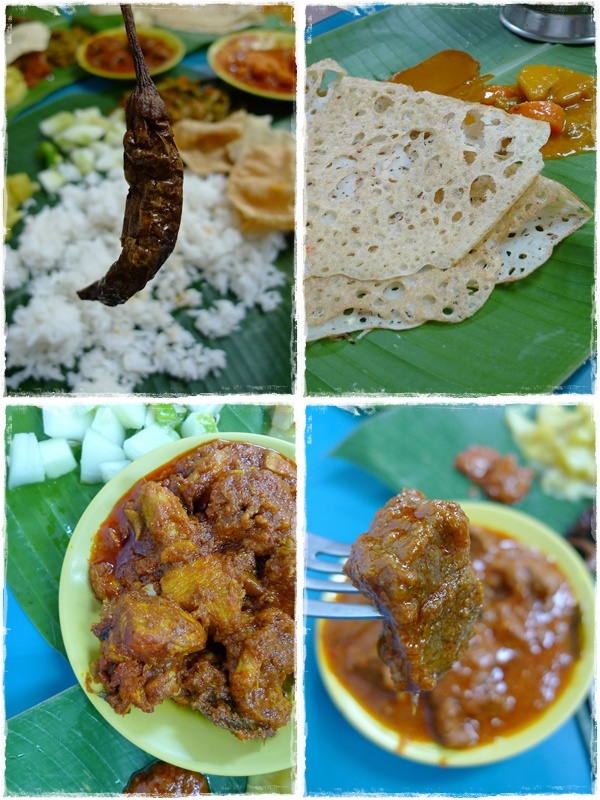 But we settled for the curried meats to be shared amongst the four of us, and a Rawa Thosai to lessen the carbo-guilt. Yeah, right. The service was surprisingly efficient, TOO efficient, if there’s ever such a term. From previous lacklustre reviews on the less-than-stellar service, we were taken aback by the prompt and friendy staff. To imagine we did not even have the time to think about what to order, and already banana leaves were laid in front of us. While some were away to the washroom, the machine gun-like rattling of the chirpy staff tickled us pink, and we were somewhat coerced to order banana leaf meals for 3, and a Rawa Thosai for the other. Not that I mind, for we were there to appease the BLR cravings after all. And in an instant, rice, vegetables, and papadom were hastily placed on one’s ‘platter’, and ladles of curries (3 varieties – dhall, fish curry and chicken curry) was drizzled/spooned/drenched on the white rice. Another equally cheery Indian man walked over with platefuls of curried meats (mutton, chicken and prawns) to tempt the senses, and we ended up with a plate of each. Do bear in mind that the sambal prawns cost RM10 per plate, but came with at least 15 pieces of deshelled, plump prawns. The place was packed on the evening we were there for dinner. Which says a lot about the popularity of the restaurant, and the quality of the food. 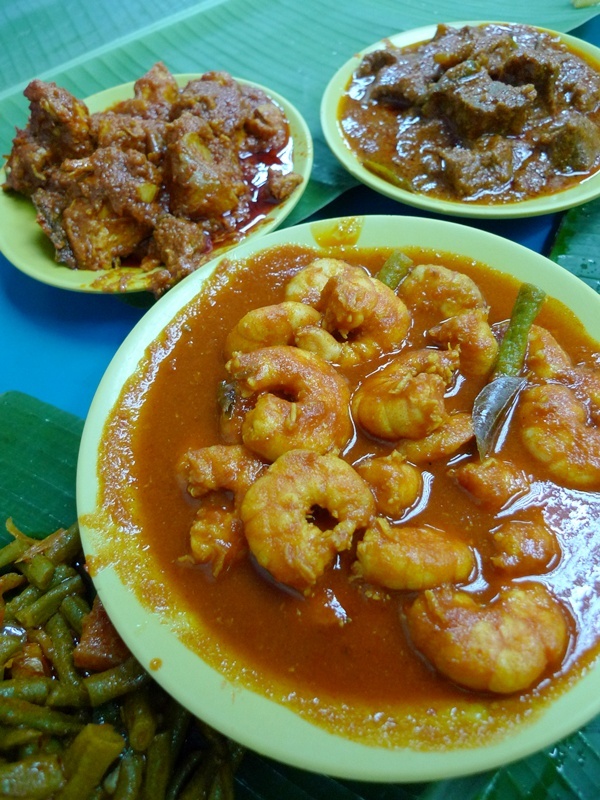 The Sambal Prawns was the spiciest among the rest (not the sweating buckets, habanero experience like AWOL‘s, but still hot enough), while the chicken curry was the most lacklustre of them all. The mutton was good, typical Indian style of cooking with the tender cuts of mutton offering a most pleasant bite, complemented well by the thick and aromatic curry. Open 7 days a week 7am to 10pm. Directions to Kanna Curry House : The restaurant is located behind Lisa De Inn, a hotel that faces the Rothman roundabout that connects Jalan Universiti and Jalan Semangat. From the Federal Highway, you can turn into Jalan Utara exit, following the signboards to Jalan Universiti, passing by Section 14 in Petaling Jaya. Once you’re on Jalan Semangat, go forward until you reach the Rothman roundabout that connects to Jalan Universiti at 3o’clock turning, and towards Sea Park and SS2 at 12 o’clock. Go straight towards SS2 direction, passing by Hong Kee Dim Sum and Green View Restaurant on the left. When you see cars turning left towards SS2 direction, you go straight instead, and you can actually see Kanna Curry House on a higher level, on your right. and boo_licious take on Kanna way back in 2005 (!!). I have never been to Kanna Curry House before. Always finding myself in a local mamak near my place to be the spiciness food I search hehee. .-= ladyviral´s last blog ..Backdated – R.O.M. Evening =-. Just had BLR at Lotus Restaurant few weeks ago. Nom nom nom sedapnya. I never wander around the area behind Lisa De Inn. Will try this restaurant when I’m going SS2. Lotus is everywhere huh? there’s even one in Ipoh, wondering whether they’re one of the same. .-= iamthewitch´s last blog ..More pictures of ROM =-. is it the poppy seeds that are getting you addictive to BLR? erm, gotta be the seeds, the curry, the assorted vege and pickles, and the crunchy papadom. oh thanks. opens in the afternoon only ah? Try Raju’s beside the LaSalle school in PJ. Nice!!! Raju’s on Jalan Gasing? heard that the roti there is nice, though slightly pricey. may get to that in the near future. Dont like Kanna at all. I prefer Jln Gasing’s Raju though pricey! But then Indian food are spicy and it always taste great except the cold veges. cant expect the vege to be cooked on the spot, as they have to cater to the immense crowd at any time of the day! cold curries on the other hand, might be one of the bane of BLR! claypot mutton on Jalan 222? Krishna? My Indian friend once recommended to me the place. possibly next on my list. somehow, kanna is a bit expensive! but most indian food can be overly charge! .-= sc´s last blog ..<a href=\ =-. you work somewhere near Masjid jamek ah? my all time fav as well…..
It’s so hard to be a flogger, need to eat so much yet need to maintain our weight. 😛 Any tips? .-= allie´s last blog ..Best Char Koay Kak in Penang! =-. been trying to cut down on the rice man..but u just stoked the fire for some good loving for white rice..
erm, eat rice one day, then oats the next. haha … can ah? Did you try their Ayam Goreng or not, very tender and succulent ..
Never never try their fried sotong .. RM 12 bucks man .. the last time i kena charged. we didnt try the fried items lah, for they plonked the plates of curried meats in a flash! hahahahah … maybe next time then.